It's possible to use your webcam, cheap or not, to track your face for Hands-Free camera movement in Elite: Dangerous. There's no need for infra red leds taped to your headset, and definitely no need to spend $150 on Track IR. 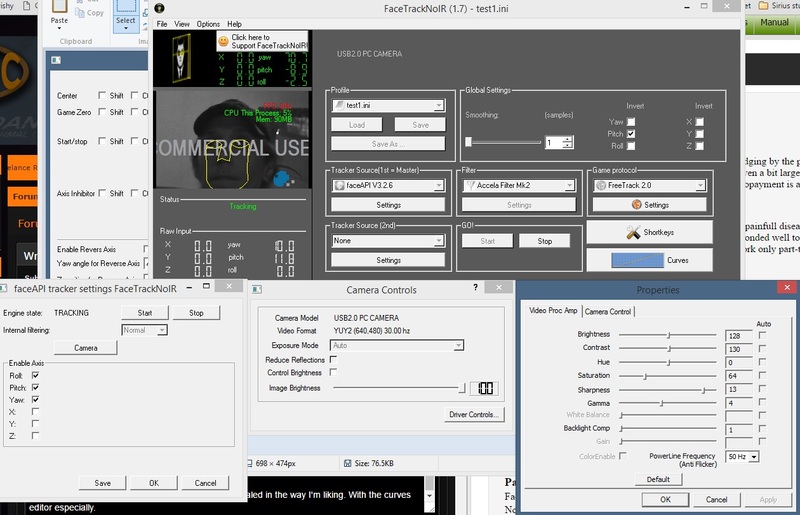 I'll walk you through how I got an older version of the program FaceTrackNoIR to work on a $6 cam straight from china. First, check out this video by Deja Drew on YouTube showing the program in action and an overview of the settings you'll need to tinker with. In his top comment he has a link to where he's uploaded the exact 1.7 version(with the allgames.csv) ready to go. Here is the link to that. (for as long as it is available, so get while the gettings good). Okay, once I downloaded and extracted that .zip into its own folder it didn't quite work yet. Solution? The official facetracknoir.nl site has a free Plugin-Pack to update older versions. Great news right? Just install that pack into the folder you extracted the dropbox .zip to. If at first your Camera screen is totally black: Go to faceAPI Settings, click Camera, Driver controls, and press Default. Here you can adjust your brightness/contract and whatnots to get a better image in different lights. Default has worked fine for me but I'm in a dark room with no window behind me, so you may have to fiddle with it. But if the "Widget" is appearing over your face you are good to go. And that's all I did. It took me a couple days to get it dialed in the way I'm liking. With the curves editor especially. The only setting I did differently from Drew was leave 'Roll' enabled on a slow curve and have a key to lock it. For some reason Elite would load up with the camera a little askew. -Numpad 1: reset zero (of facetrack). Game snaps to center view and where you are looking is now zero. -Numpad 2: reset game zero. I have this bound but doesn't seem to help anything in game, it makes the game view jump weirdly, so maybe leave unbound. -Numpad 4: This I've set to lock roll when pressed. Once you first fire up the game and set the "straightness" of your view you don't need to touch it again. (Unless it derps while acquiring your face, which is rare if you leave the tracking enable in the background for the Enable/Disable key. And last but not least these are my curves settings. You want to leave a couple of degrees of deadzone at the start of each just for sanity's sake. The Left side "Output" is the total degrees the camera will turn in a given direction. As Drew said in his video sometimes if the "Cap" is higher than the total limit of the ship camera is higher it will do that bugout thing, but go back to normal once you're looking under the Cap. For example, the Sidewinder allows you to look farther up-and-behind you, while other ships will barely let you look up 90 degrees. So experiment with the Cap for your current ship so you can max out your "scope of view' without going over the ingame limits. 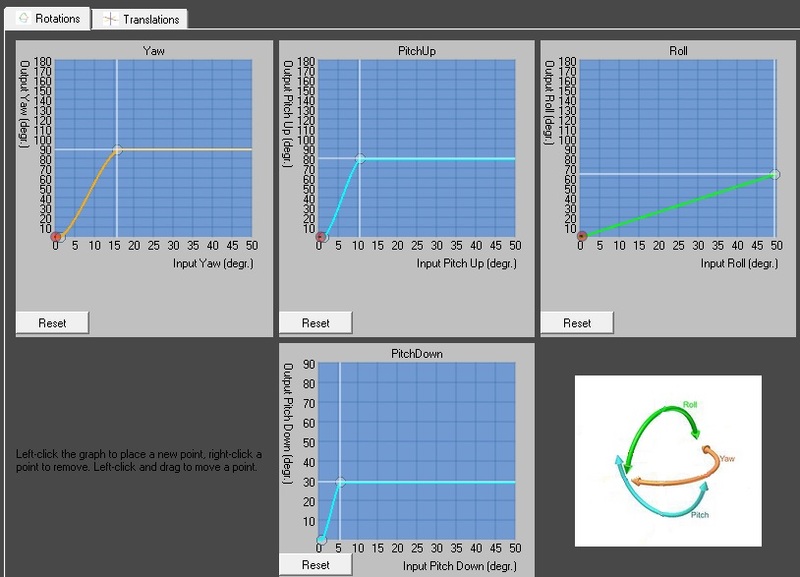 The Bottom "Input" is how far you need to turn your head in order to achieve your Cap turning. I've left mine relatively low and linear so I don't have to turn my head very far to achieve the view Cap. And there you have it. TrackIR capabilities without having to spend $150. All you need to do is fire up facetracknoir before you start Elite: Dangerous. There is no need to set anything ingame. Elite just recognizes the tracking program as "TrackIR" and automatically sets the camera to act as such. 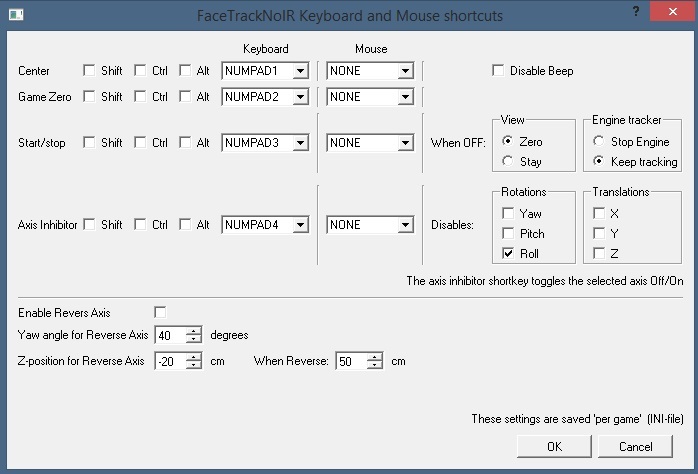 Note: your normal "look" keybinds will no longer work with facetracknoir running in the background. It was nice to finally set my power management pips to the Hat switch on my Logitech 3D Pro! Any questions or comments are appreciated. Fly Safe Commanders.